The Breville is a popular brand in many parts of the world, known for its product durability and sturdiness. This model has a stainless steel housing, giving it a very modern look that is solid, yet sleek and appealing. 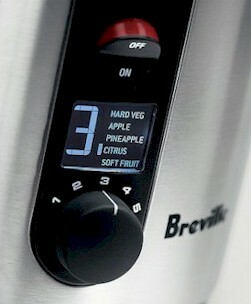 The attention to details is a welcome change as Breville continues to improve their juicers. As a centrifugal juicer, it is still one of the best currently available in the market. Speed: As the name implies, this machine is built with five variable speeds, ranging from 6,500 RPM to 12,500 RPM. The lower RPM is made for juicing softer fruits like melons (e.g. cucumbers, watermelons, cantaloupes); whereas the higher RPM is meant to juice denser and hardier produce like root vegetables (e.g. carrots, beets). These are adjustable using a backlit control panel. 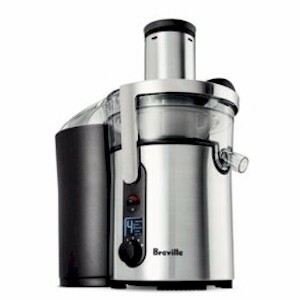 As is the Breville’s trademark, this machine boasts of being very fast and is able to produce an 8-ounce glass of juice in five seconds. Fast is good for industrial use (juice bars) as it saves time and money. Note: It probably doesn’t matter to some people, but for the sake of safety and healthy juicing, I personally recommend that you core the apples as the seeds contain small amounts of cyanide. No problem if you don’t drink much apple juice, but if you take 4-6 apples a day like me when I do juice feasting, then you would want to remove the seeds. Handling: Assembling and dismantling the BJE510XL has been made to be easy too. There are only four pieces to put together: the juicing chamber, the strainer basket, the pulp container and the chute cover. Easy to clean: Its neat, stainless steel design makes it easy to clean. There are no hard-to-reach corners, allowing for easy wash-up. Washing up your juicer immediately after use also helps prevent unsightly pigmentation build-up. Before you start juicing, line the pulp container with a bag to save washing up time. Noise level: For a centrifugal juicer, this BJE510XL seems to be quieter than most other centrifugal juicers. It’s certainly quieter when operating on its low speed and gets louder with the higher speeds. Speed: Although the five variable speeds are handy for various juicing, the lowest speed at 6,500 RPM is still very high speed. The exchange of +ve and -ve ions during high speed spinning oxidizes the juices at a rapid rate, destroying enzymes and nutrients. Noisy: A centrifugal juicer will always be noisier than a gear juicer. With this model, it gets louder at its highest speed. Something to think about if you like to juice in the early morning before everybody wakes up. Very soft fruits: As with all centrifugal juicers, they are not very good with juicing small or very soft fruits like tomatoes, and most berries (e.g. raspberries, cranberries, blueberries). Due to its high speed spinning (even at lowest speed), and the lightweight of these fruits, the fruits get flung out either through the pulp spout or through the feeding chute, even before they get chopped up for juice extraction. This is something to consider when buying a centrifugal juicer. Froth: Due to its high-speed spinning, there is bound to be lots of foam produced for every glass of juice. This is why the juicer comes with a froth separator for those who prefer not to include the froth in their juice. I personally won’t drink the froth as it adds unnecessary “gas” into my digestive tract. Wet pulp: As with most centrifugal juicers, the expelled pulp is still rather wet and moist after juicing. This means less juice yield and more wastage. If you juice heavily, it can be disheartening to see the wastage when the pulp still comes out wet. In the long run, it can prove to be rather costly to be buying more produce for more juice. Warranty: Warranty period is only for one year. Whereas a gear juicer could give you between 10-20 years warranty on the motor, which by itself is already a worthwhile investment. Pricey: For its price, I would rather pay a little more and invest in a slower gear/masticating juicer that preserves the enzymes and nutrients; and one that squeezes out very dry pulp. Definitely more economical and a healthier option in the long run. Call me bias but I’d rather have a gear juicer anytime. RPM: 5 speeds ranging from 6,500~12,500 RPM ! !